What does LORAN stand for? What does LORAN mean? 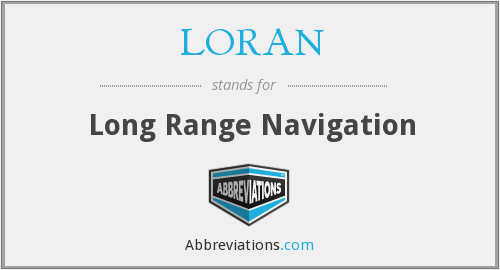 This page is about the various possible meanings of the acronym, abbreviation, shorthand or slang term: LORAN. LORAN is an obsolete terrestrial radio navigation system which enables ships and aircraft to determine their position and speed from low frequency radio signals transmitted by fixed land based radio beacons, using a receiver unit. The most recent version of LORAN in use is LORAN-C, which operates in the low frequency portion of the radio spectrum from 90 to 110 kHz. Many nations have used the system, including the United States, Japan, and several European countries. Russia uses a nearly identical system in the same frequency range, called CHAYKA. In recent decades, LORAN use has been in steep decline, with the satellite-based Global Positioning System being the primary replacement. However, there have been attempts to enhance and re-popularize LORAN, mainly to serve as a backup and land-based alternative to GPS and other satellite navigation systems. The current LORAN system has been phased out in the United States and Canada. The United States Coast Guard and Canadian Coast Guard ceased transmitting LORAN-C signals in 2010. Couldn't find the full form or full meaning of LORAN? Know what is LORAN? Got another good explanation for LORAN? Don't keep it to yourself! "LORAN." Abbreviations.com. STANDS4 LLC, 2019. Web. 22 Apr. 2019. <https://www.abbreviations.com/LORAN>.